A player with many fine qualities and a few minor flaws that may bother some listeners a little, others not at all. Much of the bother concerns the bass, so you really should see how the bottom end grabs you! KI stands, of course, for Marantz 'brand ambassador' Ken Ishiwata, whose special attention has graced those models that bear his mark. Typically, this means adding features to the basic item along the lines of better passive components, toroidal instead of frame transformers, and so on. Both apply to this model, and the chassis has been reinforced and copper-plated, and higher-quality phono sockets have been fitted - mind you, they connect to the circuit board via some undistinguished push-on connectors, so we're not sure if that's an obvious net gain. 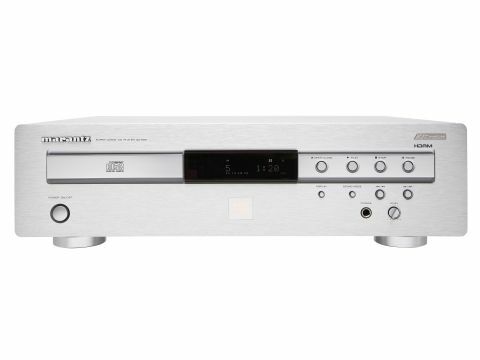 Rumours abound that this model is internally very similar to the Denon DCD-1500AE, but that's clearly not the case. The transport mechanism looks similar, but it behaves differently, giving a slower loading time, and all the following circuitry is different. Marantz has chosen a Cirrus Logic DAC chip and follows it not with the near-invariable handful of op-amps but with a dense assemblage of discrete transistors, which perform filtering, buffering and output functions. Assembly is very neatly done and the player has a good standard of finish. It seems a little noisy mechanically, especially when playing SACDs, and on the ergonomics front we found the identical and adjacent 'Open' and 'Play' buttons a bit of a nuisance. As with most SACD players currently around, it's a stereo-only machine and features are fairly frugal - select the SACD or CD layer, programme track order, dim the display. That's about it. Taking our first look at this player in HFC 284, we felt that its bass was not quite all it might be in terms of energy and immediacy. It would seem that our listening panel broadly agreed with this, for while there was praise for the way the player handled midrange and (mostly) treble, there was also more than the odd mention of a slightly thin quality to the sound, especially in busy musical textures. By contrast, when there's not too much going on, the bass has weight and warmth. The Damien Rice track has some moments of deep bass, which brought forth descriptions of a "big sound", though it also had traces of sibilance. On the orchestral track, some lack of precision and space around the performers was noted. The most successful track overall was the baroque chamber music, where the limited bass extension of all the instruments and the natural acoustic space around the instruments was neatly and believably portrayed. Solo piano did well, too, with praise for the dynamic and full-bodied sound. SACD replay seems on the whole to share the characteristics of CDs, though once again bass appears to have a little more detail, insight and control. Overall, the sound is just a shade more relaxed. All of which largely boils down to a matter of taste. The player's relaxed sound and lovely midrange tonality are highly commendable, and there are definite strengths in the detail and imaging departments. In many respects it's a player that's easy to live with, sonically speaking, but while the 'KI' adds a touch more refinement in some areas, we suggest that the standard £430 SA7001 offers better value overall.